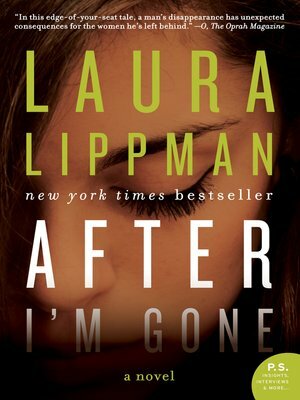 Laura Lippman, the acclaimed New York Times bestselling author of The Most Dangerous Thing, I'd Know You Anywhere, and What the Dead Know, returns with an addictive story that explores how one man's disappearance echoes through the lives of the wife, mistress, and daughters he left behind. When Felix Brewer meets Bernadette "Bambi" Gottschalk at a Valentine's Dance in 1959, he charms her with wild promises, some of which he actually keeps. Thanks to his lucrative—if not all legal—businesses, she and their three little girls live in luxury. But on the Fourth of July, 1976, Bambi's comfortable world implodes when Felix, newly convicted and facing prison, mysteriously vanishes. Though Bambi has no idea where her husband—or his money—might be, she suspects one woman does: his mistress, Julie. When Julie disappears ten years to the day that Felix went on the lam, everyone assumes she's left to join her old lover—until her remains are eventually found. Now, twenty-six years after Julie went missing, Roberto "Sandy" Sanchez, a retired Baltimore detective working cold cases for some extra cash, is investigating her murder. What he discovers is a tangled web stretching over three decades that connects five intriguing women. And at the center is the missing man Felix Brewer.